In March I wrote a post about Missouri’s drinking water systems, noting that the vast majority of them met national safe water standards, but a few did not, and some of them were repeat violators. States report drinking water information to the EPA, which publishes a nation-wide summary. The most recent report covers 2010. 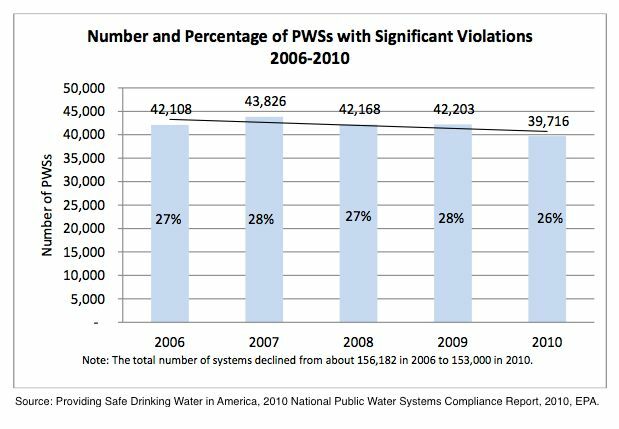 The first graph at right shows that nationwide the percentage of water systems with significant violations has decreased very slightly from 2006 to 2010. Of the 39,716 total violations, only 10,054 of them were health-based. This represents about 7% of public water systems nationwide The rest of the violations involved testing, public notification, or consumer confidence standards. The second graph shows the total number of violations per state. There is tremendous variation between states, and the pattern is not easily interpretable. Missouri is near the middle. The total number of violations is an almost useless statistic. There are many rules to violate, and each is counted as a separate violation. In addition, testing occurs repeatedly, and each repeat is counted as a separate violation. Plus, violations can occur because of health-related issues, or because of testing or reporting issues. Missouri calculated that the total coliform rules alone create the potential for more than 30,000 violations. What one would really want to know is whether the water in one’s state is generally safe. The best indicator of this might be the percent of the population served by water systems that had no health-related violation during the year. Missouri reports such a statistic in its report, but EPA does not. The closest they come is a calculation of what percentage of water systems experienced a “significant violation,” whatever that means. Twenty-one percent of public water systems nationwide experienced a significant violation. Missouri does not report this statistic, so no comparison of Missouri to other states is possible. 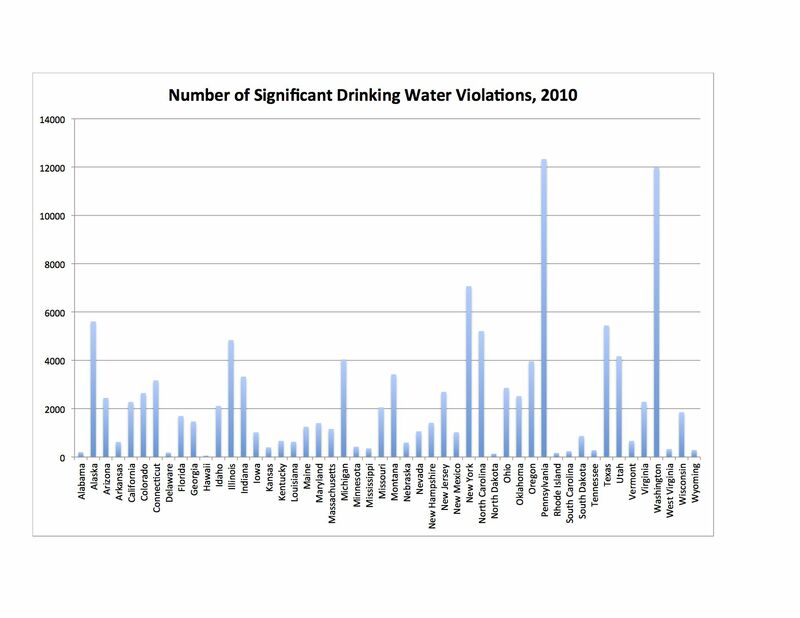 Providing Safe Drinking Water in America, 2010 National Public Water Systems Compliance Report, Office of Enforcement and Compliance Assurance, EPA, http://www.epa.gov/compliance/resources/reports/accomplishments/sdwa/sdwacom2010.pdf. By mogreenstats in Water on 2013/05/06 .